Picture - The Du Temple Monoplane. 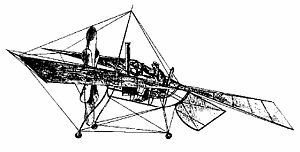 The du Temple Monoplane was a large aeroplane made of aluminium, built in Brest, France, by naval officer F�lix du Temple in 1874. The plane had a wingspan of 13 m (43 ft) and a weight of only 80 kg/180 lb (without the pilot). Several trials were made with the plane, and it is generally recognized that it achieved lift-off under its own power after a ski-jump run, glided for a short time and returned safely to the ground, making it the first successful powered flight in history, although the flight was only a short distance and a short time. The plane was displayed at the 1878 World Fair (Exposition Universelle (1878)) in Paris. Picture - Patent drawing of the Monoplane, 1874. The plane used a very compact, high-speed circulation steam engine for which F�lix du Temple applied for a patent on 28 April 1876. The engine used very small pipes packed together "to obtain the highest possible contact surface for the smallest possible volume"